I have mixed feelings about drawing cats, and thus about this story. On the one hand, it’s really fun. On the other hand, it’s a little tricky, and I feel I never quite get the right balance between making them little animals and making them little manga-faced people. Nevertheless, I enjoyed this page a lot. Plus, PIGS! 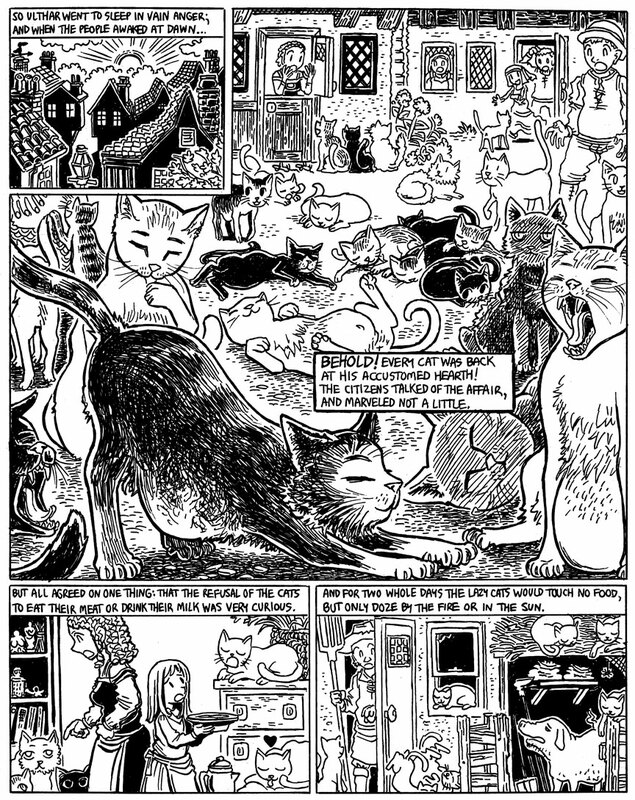 I mentioned it in the “Annotated Dream-Quest” already, but I want to give another shout-out to one of my favorite children’s books, Millions of Cats by Wanda Gag. My parents used to read it to me when I was a kid. It came out in 1929, so conceivably Lovecraft could have seen it on the shelves while he was browsing bookstores in Providence, unable to afford any new books, and in fact, looking longingly at his own old books he had recently had to pawn for money to eat. I wonder if Lovecraft’s mother ever bought him any normal kids’ books when she wasn’t buying him Goldfinch’s Mythology and The Arabian Nights. I guess the dime novels he used to read count as YA. Anyone who has ever cared for a cat for any length of time can tell you that when the cat refuses food, it’s time to shop for a new brand–your cat got bored of the old flavor! Your depiction of the stretching cat reminds me of my Mother’s cat, Tweeter. When awakening from a nap, she stretches out her forelimbs, claws extended (as in your drawing). This position pulls all her mass towards her hindquarters, making her look rather pear-shaped. She then reverses position, drawing in her forepaws and stretching out her hindlegs; all her mass migrates to her shoulders, giving her an exaggerated “body-builder” sort of physique. Cats are endless fun to watch! The Arabian Nights isn’t a normal children’s book? It was part of my childhood… then again I was born in Europe, maybe it’s a cultural difference. I actually have always been fond of the way you’ve drawn cats. It’s the people who sometimes look too manga-faced to me, but somehow I don’t mind it in cats.